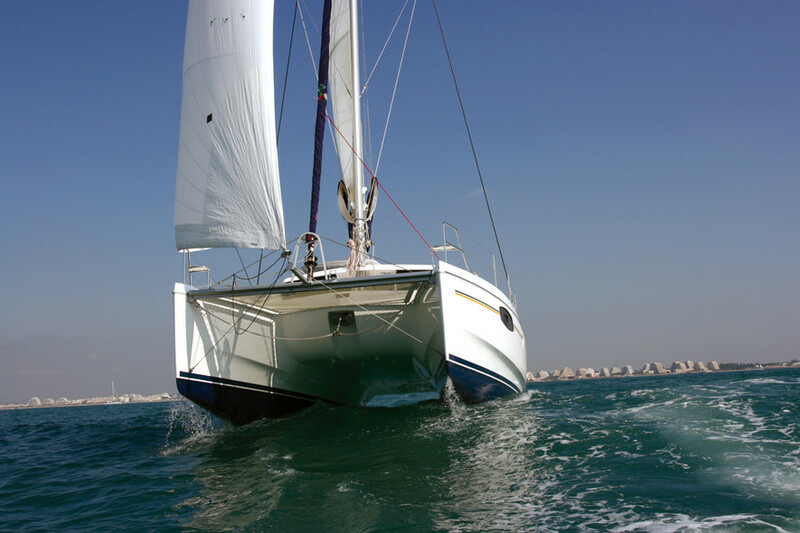 Despite its 100% cruising orientation, the Leopard 39 displays respectable performance on all points of sail. Two people can sit at the helm, whilst remaining close to the other members of the crew. A boat for living! Complying with the inevitably very demanding specifications of the world’s biggest charter company (Moorings/Sunsail), has got to be good! Both builder and architects are obliged to reconcile aspects which are naturally contradictory, such as comfort, volume and...sailing pleasure and speed. We have to admit that with the Leopard 39, the South African builder presented, in 2010, a rather attractive catamaran. Our regular tester, Philippe Echelle, let himself be tempted by an outing in a good breeze: a 31-knot gust and a good wave propelled the catamaran at 17.6 knots. And with full sail! We couldn’t advise you to give the boat this kind of treatment, of course...but this anecdote shows that five years ago, for its launch, the Leopard made an excellent impression. Ditto in the United States, where the specialized press at the time wrote lots of good things about this boat, which in reality has several names: Leopard 38, Sunsail 384, Leopard 39, Moorings 3900… Four names for an almost identical catamaran: the last two – 126 examples – are equipped with a polyester bimini as an extension of the coachroof, and a rigid ‘cap’ which covers the steering position. On the 38 and the 384 (69 examples of which were produced in 2009 and 2010), the bimini was slightly raised and the helmsman had to be satisfied with a canvas protection. Another distinctive feature: the Leopards, with their three cabins, are dedicated to private owners, whilst the other two models, charter oriented, are equipped with four cabins. The marked longitudinal steps in the hulls maintain a moderate beam at the waterline.